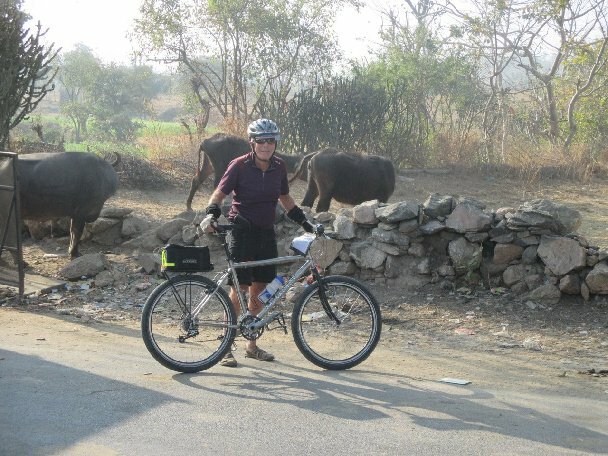 I felt that my first India bike tour, in 2010, was so extraordinary that at this point it would be interesting to return to that part of the world to see the amazing changes which have taken place and how the Backroads Co. has tweaked its tour. The 2010 tour was my 18th with Backroads and the recent one, in 2017, was my 38th. On both trips I flew from New York to Delhi or Mumbai and then to Jodphur (India’s Sun City or Blue City) On my arrival I met the ten or six other members of my group. These folks ranged in age from the 20’s to 70’s and most have participated in a number of Backroads trips. They hailed from all regions of the US and on each tour there was also one Canadian or Australian. 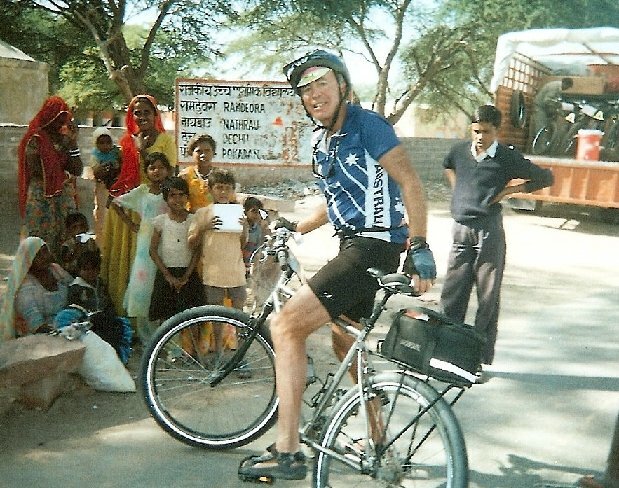 We were ably supported by a staff of one or two Americans(who cycled with us) and four or five Indians drove several support vehicles. One was a minibus which shuttled us between cycling stretches and another drove a large truck which carried our luggage and bikes which were not used. The American leader on each tour (Matt and Chuck) had many years experience with Backroads and had been my leader on a past tour or two. Unlike many other bike tours (with Backroads and other companies) this one was not about great daily cycling mileage. The 2010 tour encompassed about 200 cycling miles and the 2017 tour which designated as “Mulitsport” involved fewer cycling and more walking miles. 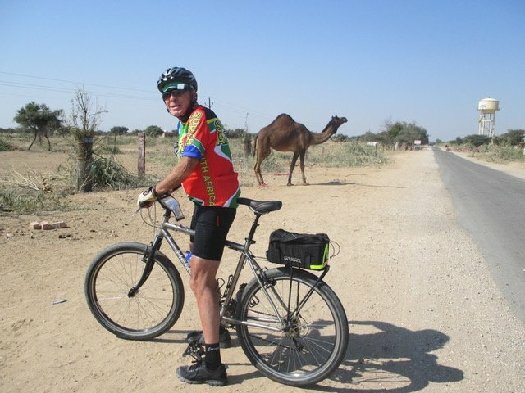 Cycling mileage in India cannot be compared to cycling mileage elsewhere because so much is happening on or near the roads. The route is being used by large trucks, cows, motorbikes, women carrying many pounds of everything on their heads while walking and children of all ages excitedly walking, running, and waving to us. The “walking part” was mostly in urban areas where we could slowly appreciate what makes India tick. We were shuttled out of and into some heavily trafficked urban areas and through somenot so beautiful stretches. One of the shuttles was for over three hours. The Backroads routes did include some peaceful and scenic country lanes. Most of the roads were “paved” (to some extent!). There were some potholes and in some cases there was murky water on the road. At one point I had to put my feet down onto a deep “puddle” Because I was not sure what was in the puddle I took my shoes off right after and applied disinfectant on my feet and legs. Because we had to “jump off” the road in a large vehicle was approaching us from the front or behind, we had the use of mountain bikes. The priority on Asian roads goes to the largest vehicle: “Might is right” Indian motorists use their horns frequently and we got used to getting out of the way when we heard a horn which sounded like it was coming from a large vehicle. Driving on the left is the rule in India and this makes right turns and traffic circles challenging for the cyclist. Backroads posted its support people and tricky intersections to direct us cyclists and other traffic. The nine day tour which cost about $9,000 now was $6500 in 2010. It included use of a mountain bike, some of the best hotels in the world, almost all meals (Indian and Western cuisine—both excellent+) Air fare, and minor costs for some alcohol and 1 or 2 tips were extra. There were a few climbs, nothing too long or steep. On one of climbs there were dozens of wild monkeys on both sides of the road rooting for us. In addition to monkeys and cows, there were camels, goats, elephants, antelopes, ostriches, peacocks, sheep, ducks, water buffalo and chickens. There were all types of vegetation: plants, flowers, trees and rice paddies. One night was spent at a luxury tented camp. Around sunset cyclists rode camels. I opted to walk along the leader. Sipping wine and watching the sunset and the ensuing starry sky was a high point. We visited rural villages and saw the modest homes of the residents, temples, forts and palaces. Towns visited included Udaipur, Narlai, Ranakpur, and Delwara. After the Backroads tour, Joan and our friends arrived and the four of us took a week long train trip through the same general area. 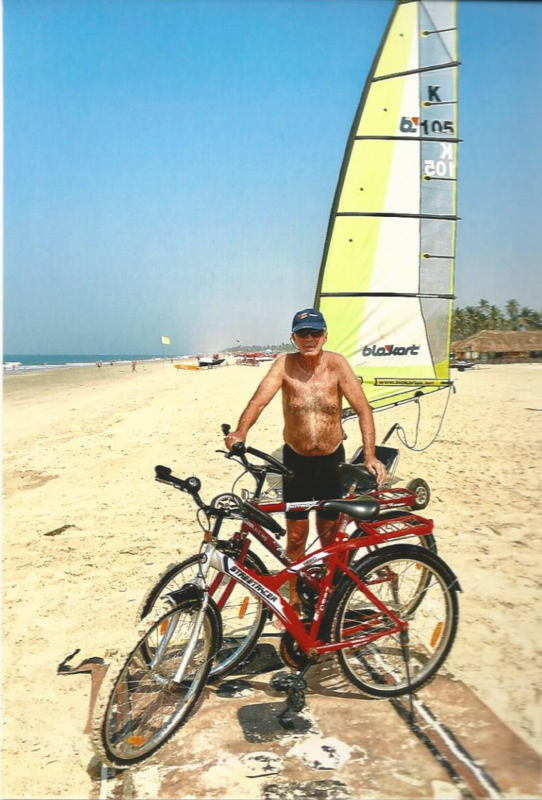 The we went to Goa, where I cycled each morning on hard packed sand on an Arabian Sea beach with a background of lush palm trees with an English doctor I met. Finally to Mumbai where Joan and I walked for about 5 miles along Marine Drive aka “The Queen’s Necklace”and through some of Mumbai’s infamous slums. When I landed at Jaipur the weather in the mornings was colder than the previous trip. Based on my previous trip I didn’t bring a jacket so I visited the local outdoor market and purchased a jacket for $4.00 US. It wasn’t very good quality but it lasted for a few hours the next few mornings. After that it got warmer and it was in the 70’s and 80’s and sunny the rest of the tour with zero precip. January is definitely in the dry season! Striking changes recently in India! In a short period of time this astonishing country has come a long way. The tourism infrastructure has changed in many ways. Bribery is no longer necessary to get on a plane. Sanitary facilities are noticeably improved. Very few people I met have experienced “ Delhi Belly” Go there soon before it all looks like Los Angeles!